Voodoo Dreams Casino greets all new registrants with an attractive welcome package of €1000 bonus money spread around first 4 deposits. Moreover, there is a batch of 200 free spins to play Starburst, Joker Pro and Wild Wild West. New customers are about to get their share of voodoo magic once enroll with the Voodoo Dreams Casino and make a total of 4 deposits in a row. The casino grants no less than €1000 additional cash but also an exciting amount of 200 free spins applicable on popular and rewarding video slot machines. The entire package is based around 4 real-money deposits, while an amount of 20 Starburst free spins will be given right after the registration. Players who decide to invest €100 will get their first deposit doubled with a 100% bonus, which also applies to the second worth a maximum €300. Subsequent two deposits of €300 will be matched with bonuses of 50% and 100%, respectively. On the top of it, Voodoo Dreams Casino grants 180 extra spins that can be used for 9 days in a row on NetEnt's classics such as Starburst, Joker Pro and Wild Wild West. 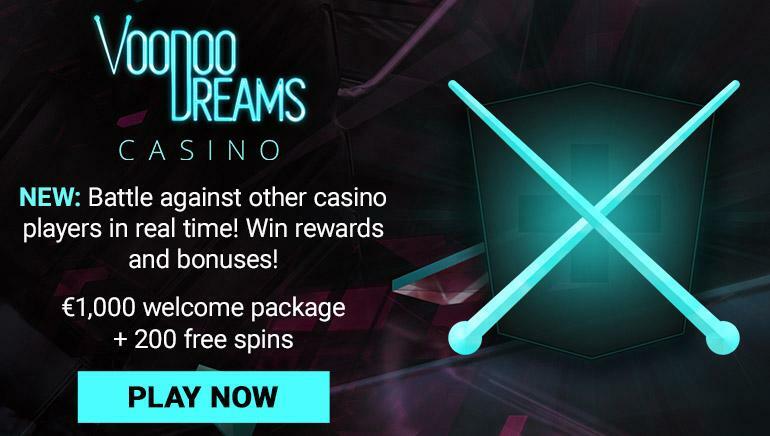 Voodoo Dreams Casino is a multi-brand resource regarded highly inside the community as being familiar for its abundance of games and a set of unique winning opportunities. On the top of – let’s call them – normal winnings, players will receive Spirit Points and Experience Points to reach new gaming levels and cast spells to claim better bonuses and more rewarding prizes. Combined with a welcome package, this sounds like a good chance to climb the leaderboard faster.